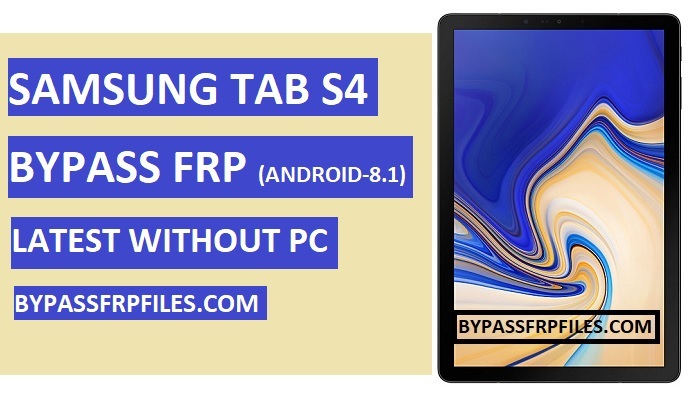 Now share with a new very latest method to Bypass Google FRP Samsung Tab S4, If you hard reset your device and forget the perviously synced gmail account then you need to Bypass FRP Samsung Tab S4 to access your device once again, so thats why share with you easy process to do it, we all know now its very annoying to facing frp lock issue on our devices, we always working to find a new method to Bypass Google FRP Samsung Tab S4 easily. So follow this method. Note:- This method we tried to Bypass SM-T835 FRP, Also you can try some other models of Tab S4 Models. FRP is (Factory Reset Protection) for our Latest Android devices, if you forget the Pattern, Password and fingerprint lock for this you have to hard reset your device by using keys, after you hard reset your device then you need to enter the previously synced Gmail ID to using your access your device home screen once again, then why we need to Bypass? its very simple answer if we forget the Gmail ID that we enter synced previously on our device, then you need to Bypass FRP Samsung Tab S4 and use our device once again, now follow the below process very carefully to Bypass Google FRP Samsung Tab S4 easily. -Once you open the apk file then tap on the “Wap Push SL” option from there. -Then on the first tab, you have to enter the “Phone Number”, and then select “USE No URL Prefix”. Make Sure:- You have to enter the lock device phone number there to Bypass FRP Samsung Tab S4 (Bypass SM-T835 FRP). -Wait few seconds, then check your device you get popup SMS on your Tab S4 device. -Congrats, now you have only few steps to Bypass FRP Samsung Tab S4, (Bypass SM-T835 FRP) Without PC. -But at first, we need to download only one application that helps you to Bypass SM-T835 FRP easily. -Once you downloaded the apk, then you will get a popup button on the button bar of your device, simply tap on the “open” button from there to Bypass FRP Samsung Tab S4. -Just click on the “Done” button to Bypass Google FRP Samsung Tab S4 Without PC (Bypass SM-A920F FRP) easily. -Then sign in there with your any valid Gmail id to Bypass SM-T835 FRP. -Now you have successfully Bypass FRP Samsung Tab S4 (Android-8.1.0) without PC easily. Thanks for visiting us, if you facing any problem with this Bypass Google FRP Samsung Tab S4 Without PC | Bypass SM-T835 FRP, comment us below.